The Paulownia cultivars are divided based on, the purposes of the plantations – ornamental, industrial, biomass production, bioethanol or for timber. Another division is based upon the climate conditions where the plants could be grown. The species from genus Paulownia has C-4 photosynthesis and are among the fastest growing timber species worldwide. 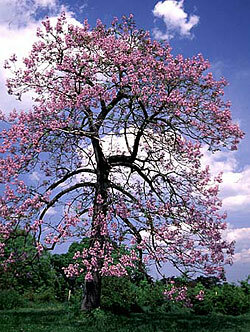 The Paulownia species are leaf fall trees and evergreen in the tropical regions. They have smooth bark, and opposite direction placed leaves. The trees develop large pyramidal groups of flowers with a huge number of seeds. The most wide spread application has the species of P. tomentosa, P. elongata and P. fortunei. For ornamental purposes it is recommended to use Paulownia tomentosa or hybrids of – P. Tomentosa X P. Fortunei. These species of Paulownia are wide rage temperature resistant. Hybrid species P. Tomentosa X P. Fortunei is a good choice for afforestation, for parks and landscape planting and decoration and. The tree develops many lateral branches, thick crown with cluster flowers which vary in color from creamy to deep violet. Paulownia tomentosa is also used in plantations for biomass. It is characterized with a well-developed crown and fast growth but not so extensive like the species Paulownia elongata. Paulownia elongata is the fastest growing species in genus Paulownia, also known as “emerald tree”. The species is recommended for afforestation and production of timber high quality wood material. Extremely fast growth develops a straight trunk, with uniform development at length. The maximal yield of timber material at the 8th year after planting reaches one cubic meter of wood and 40cm of trunk diameter. It is used for production of timber, biomass, pellets and bioethanol. Paulownia elongata is capable to adapt, grow and develop in poor soils. Paulownia elongata prevent the erosion and enrich the soil with humus. High tolerance to drought, soil content and temperature amplitudes (from –20oC to + 40oC) make the species Paulownia elongata and its hybrids demanded for environmental recovery.